Part I: Politics and You. Chapter 1: It's Politics, Baby! Chapter 2: The Money versus Vote Analysis. Part II: Making Your Voice Heard. Chapter 4: Contributing Your Time or Money. Chapter 5: Telling Politicians What's on Your Mind. Chapter 6: Getting Political on the Internet. Part III: Politics Is a Team Sport. Chapter 7: Partying with Politics. Chapter 9: Joining a Special Interest Group. Part IV: It's All Marketing. Chapter 10: Harry Handler Meets Carly Candidate. Chapter 11: Selling the Candidates, Warts and All. Chapter 12: Truth in Advertising. Chapter 13: Casting That Vote! Part V: Let the Campaigns Begin! Chapter 14: Who Says Talk Is Cheap? (Where Your Contribution Goes). Chapter 15: For Whom the Campaign Polls. Chapter 16: Dodging the Issues: What You Can Do. Chapter 17: Campaigning For Your Vote. Chapter 18: Negative Campaigning: The Dark Side of Politics. Chapter 19: The Money Thing: Is Reform Possible? Chapter 20: Throwing Their Hats In the Ring. Chapter 21: Getting the Party Started: National Party Conventions. Chapter 22: The Electoral College and the 2000 Presidential Election. Chapter 23: Some Really Big Shoes: Electing a President. Chapter 24: The Ten Commandments of Modern Politics. Chapter 25: Ten Things to Teach Your Children About Politics. 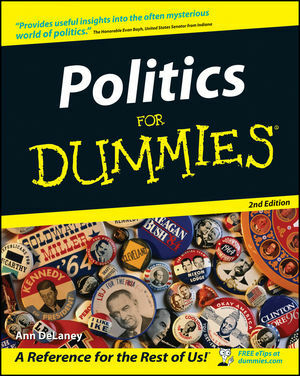 Chapter 26: Ten Common Political Mistakes. Chapter 27: Ten (or so) Quotable Quotes.